The Warrior's Call is an international upsurge of pagan love for the land, sea and sky in the face of impending fracking-induced ecocide. 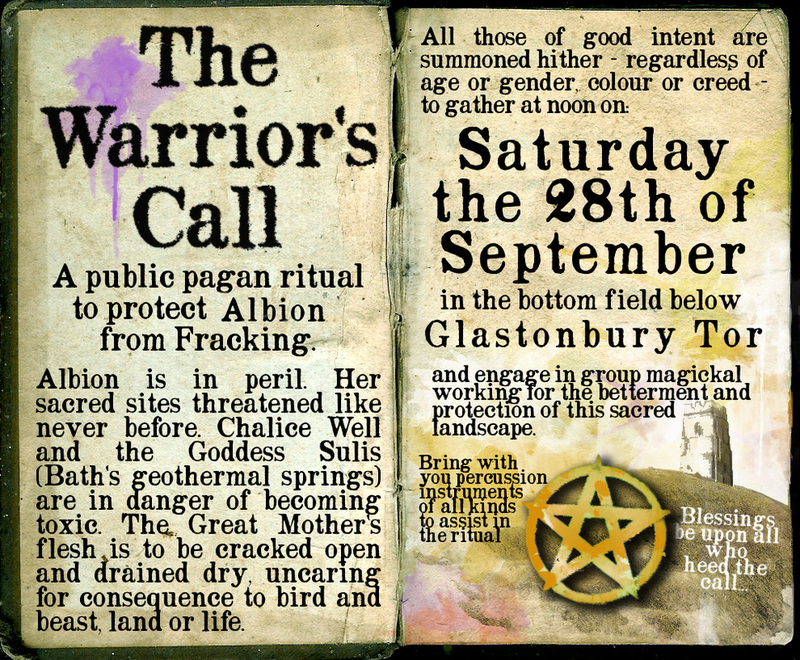 At noon on Saturday the 28th September, 2013, pagans all over the world will heed this call and conduct ceremonies to protect the environment from hydraulic fracturing for shale oil/gas aka fracking. Although we are all from many different paths, on that day we will speak with one voice. The UK (and, indeed, the global) pagan community has decided that hydraulic fracturing for shale oil and gas, is a dangerous irreversible practice which will poison and damage the environment forever. As Pagans, nature is the focus of worship and any form of damage to the land and environment is a serious concern. At Stonehenge, King Arthur Pendragon and the Loyal Arthurian Warband will be answering the Warrior's Call, by conducting an anti-fracking open public ritual on the Stonehenge National Trust Field. Simultaneously, people will be conducting their own rituals all over the world. At noon on the 28th, people will be simultaneously congregating everywhere from Glastonbury Tor to Stonehenge, Melbourne to Washington, Kathmandu to Belfast. This is, to the best of our knowledge, the largest international event focusing upon fracking in the UK to date. A sigil has been designed as a focus point for all the rituals. As a symbol, it connects all of the rituals together to bring about protection of the land, the water, the air and the environment of Albion and all other places where licenses have been granted to frack. There will also be a pagan ritual held at the Balcombe protection camp, as this is currently the main focus of opposition to fracking in this the UK. However, it must be stressed, that the reason for the gathering is not to protest, but to conduct prayers and intent to stop fracking in the UK, and indeed, the rest of the world. The world pagan community will not stand idly by and see the land and environment poisoned by a small group of short sighted, ignorant and greedy individuals at the expense of every living thing. The Warrior's Call is a calling to prayer of all who feel a strong sense of protection toward the earth upon which we all depend to live.
" Thanks to all who attended at Stonehenge the Anti-Fracking Ritual and answered The Warrior Call. We are Warriors, we are not, all sweetness and light. We fight for the Goddess, the very land it self, the Earth that sustains us. And today we called on the Ancestors to join us in this fight. We stand proud, we may be few in number compared to the forces of corporate greed and ignorance but we are Pagan and Proud and in Goddess we Trust /|\ "